These shape-shifting meringue cookies only look tricky. 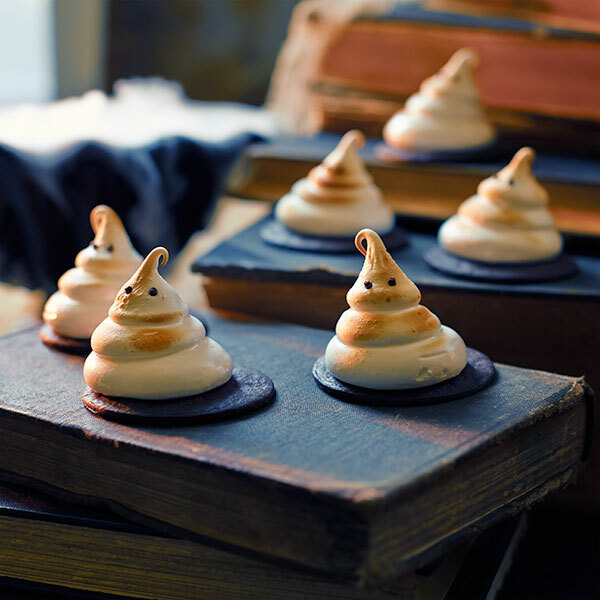 In fact, our Ghost Meringue Cookies are an easy way to make any Halloween gathering or classroom party more thrilling. Together, egg whites, chocolate wafer cookies and chocolate jimmies create a spooktacular Halloween treat for kids of all ages. Place egg whites, sugar and cream of tartar in a heatproof bowl. Set bowl over a saucepan of simmering water. Whisk constantly until sugar is dissolved and whites are warm to the touch, about 3 to 4 minutes. Take bowl from saucepan and beat mixture with an electric mixer fitted with the whisk attachment, starting on low speed. Gradually increase speed to high while beating until stiff, glossy peaks form—about 5 to 7 minutes. Add almond extract, and then mix until combined. Transfer mixture to a pastry bag fitted with a large round pastry tip. Pipe a small cone shape on top of each wafer cookie. Place in oven and bake with oven door open for 30 minutes. Turn oven off and leave in oven for another 30 minutes, still keeping the oven door open. Remove cookies from oven. Using a kitchen torch, carefully brown upper peak of meringue. Add jimmies to each cookie for the ghost eyes. Serve. Looking to bring some joy to a kid this Halloween? Don't just give candy; give laughter and smiles.